Selling Your Book Online: Solved: Amazon Just Rejected Your Self-Published eBook? No Problem. Solved: Amazon Just Rejected Your Self-Published eBook? No Problem. Just had a couple of rejects from Amazon - I needed more choices for ecommerce, and found a solution. Amazon certainly isn't the only game in town. When they reject your book, it certainly feels like that. 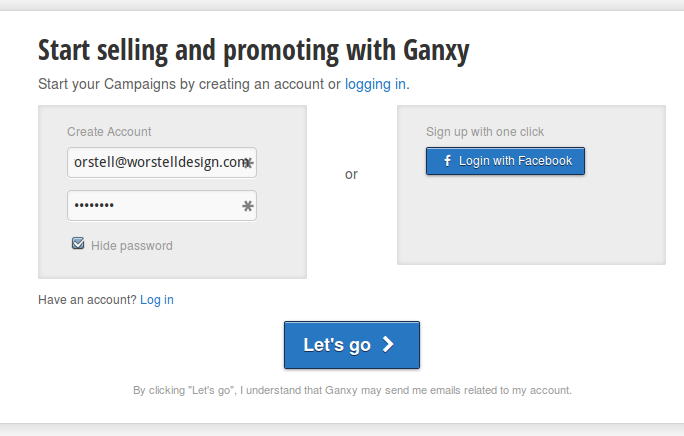 I had to look over why I was giving so many options for people on my landing pages. 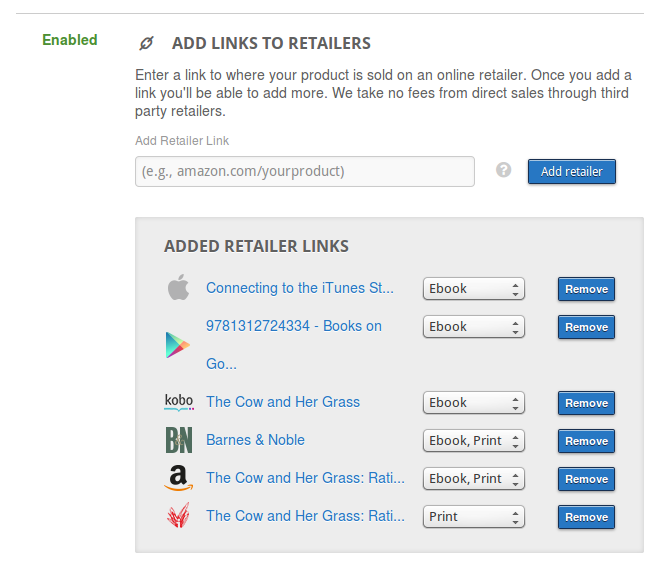 There are links there for every distributor I sell my books through. Nook, Google, Kobo, Amazon, iTunes - plus some places like IndieBound booksellers to order the hardcopy from. The reason they were there was to enable people to get the version they want on whatever device they had. It doesn't matter if they had a Kindle, a MAC, or an Android or Apple smartphone. The problem Amazon gave me was when they rejected one of my books. It's only happened four times - but that's just too many times. There was one good reason for the first two, none for the next two. The people who lose out on this are the readers. Now they can't match up the ebook with the hardcopy. They can't get an ebook for their Kindle. With that in mind, I went over to find a way people could get any version they wanted. The other option that came to mind was hosting ecommerce on the site, to sell .mobi or .az3 files which could be loaded on a Kindle. Last time I looked around, it was a complete pain-in-the kahootz to run an ecommerce site. A new search found a few options. Out of these, there were two which would sell from your own site by just adding a script. Of the two, only one would take PayPal. That made me settle on Ganxy. They host the file, and keep track of people's downloads - so they can get a new copy for any new device. It's a simple sales script you can put anywhere you want. One per book. 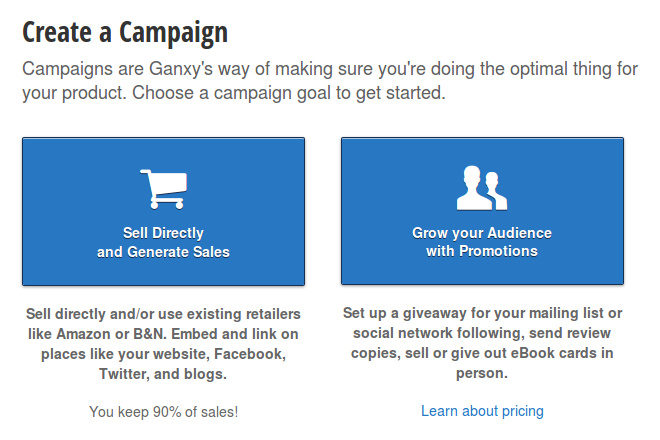 The great part is that when you do a couple or more of these "campaigns", you can offer bundles as well. That then offers up even more opportunities for your readers. They also offer a pre-release option in order to set up in-advance sales. I was all set to replace my various icons with one of these when I started seeing the problem. This fancy new sales page is in a script the search engines can't make sense of. You see, the reason for landing pages is to send link-traffic to the book distributors. Search engine traffic makes your books rank better on the distributors. The purpose of the text on your page is to give the search engines words to work with to make sense of your page and rank it. And practically, there nowadays are more bots roaming the web than people. So you want your pages to be able to be understood and categorized by them when they come - and come back. The real value in this is simply the buy button. What the reader can buy is anything that's digital. 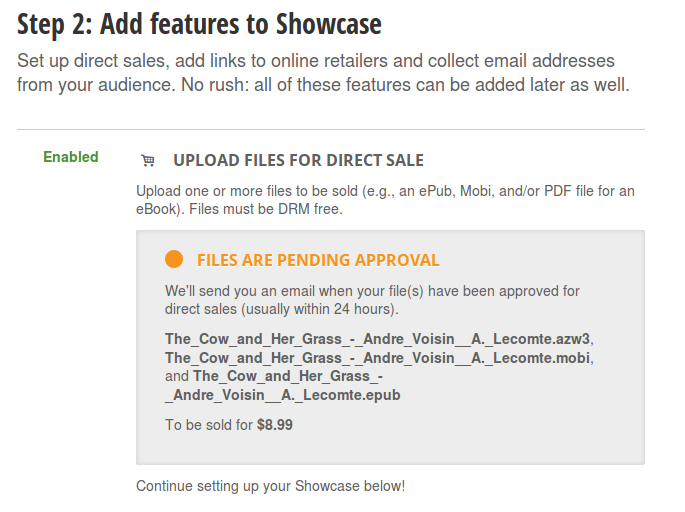 So you can sell them your .mobi or .az3 file, an .epub or .pdf. Factually, you could even sell them a .zip or .exe (although those aren't particularly trusted) and even an app for their smartphone. Anything digital. Only place close to this is Leanpub, but you have to sell them there. Of course, you only get the sales you bring to your own site/blog. Not a huge volume of buyers like you get with the distributors. Or maybe you will. You see, when you get your mailing list, you can give them all the special offers you want through a link like this and everybody wins. Easy sign up. You can even do it with Facebook. You can do direct sales or special promotions with giveaways. Upload your digital files - it takes them about 24 hours to clear, as they say. Connect to anywhere you want to sell everywhere else as well. 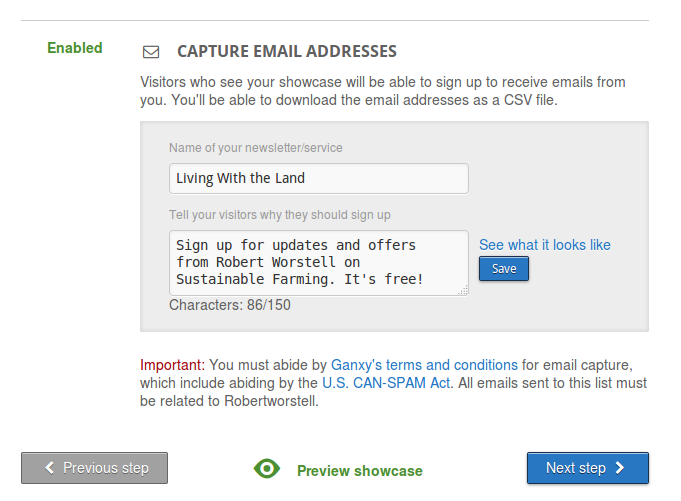 You can even collect email addresses. When you get done, it can look something like this (wouldn't fit on one screenshot). 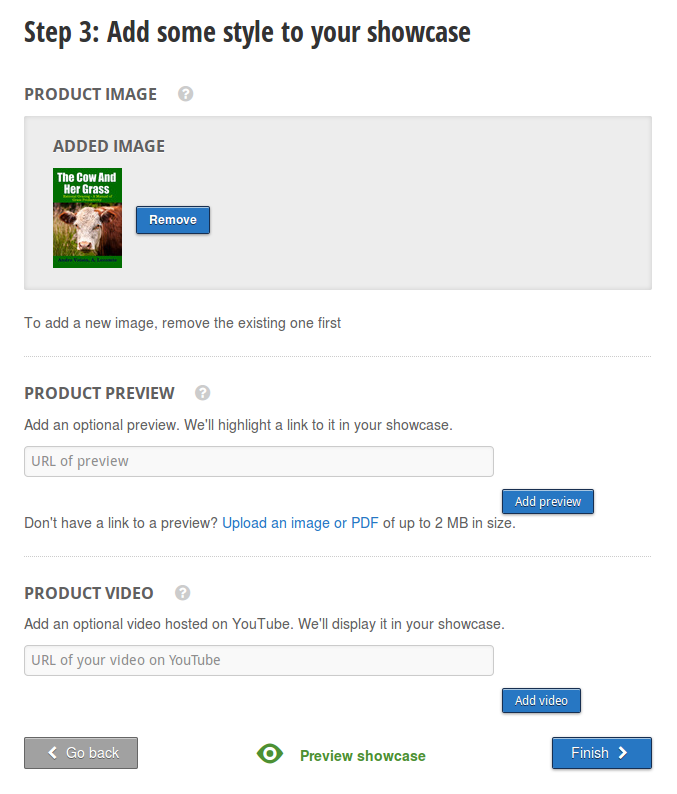 You can also add a preview and even a video about it - like a book trailer. Nice. 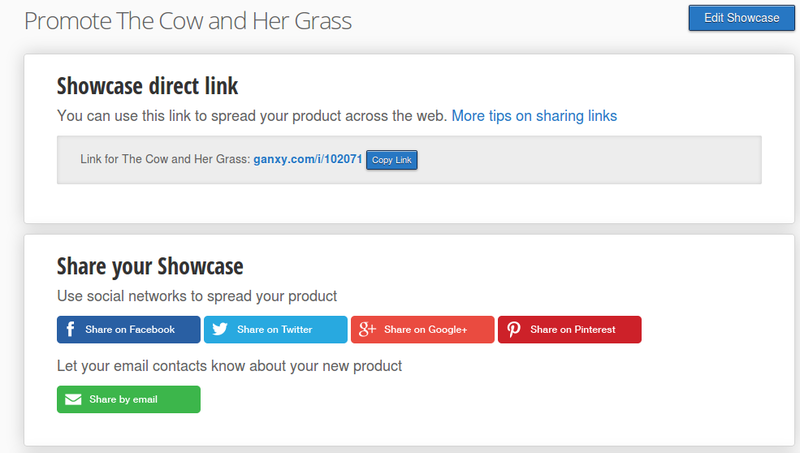 Then you have options to let everyone know about your product - they'll go to a standalone page for it. And here's the code to embed it. Note - you can turn off a lot of options here, even if you want to use the same script to do your sales elsewhere with all the bells and whistles. The way I'm using it is as a simple buy button, but you can also go to the short link to get everything including the kitchen sink. And they recommend you send it to Pinterest, Facebook, Twitter, and all those places so everyone can buy your book that follows you. The full page lets others recommend it as well. 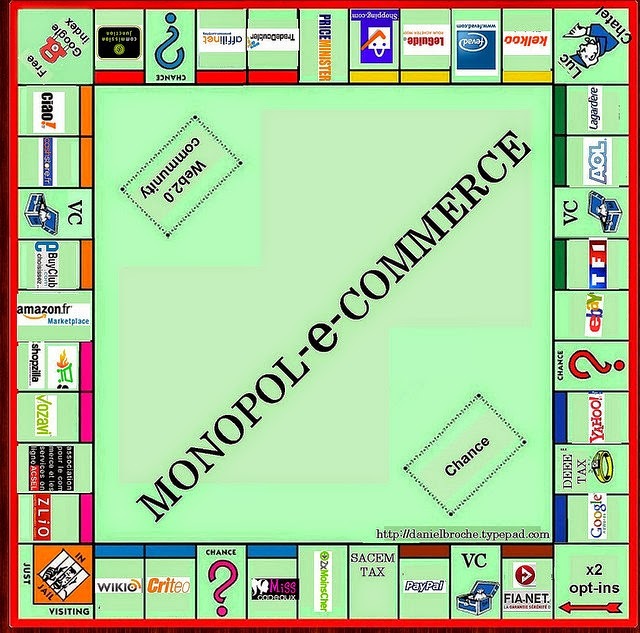 No hosting and maintenance of your own ecommerce site. And your reader/buyer gets the version they want. 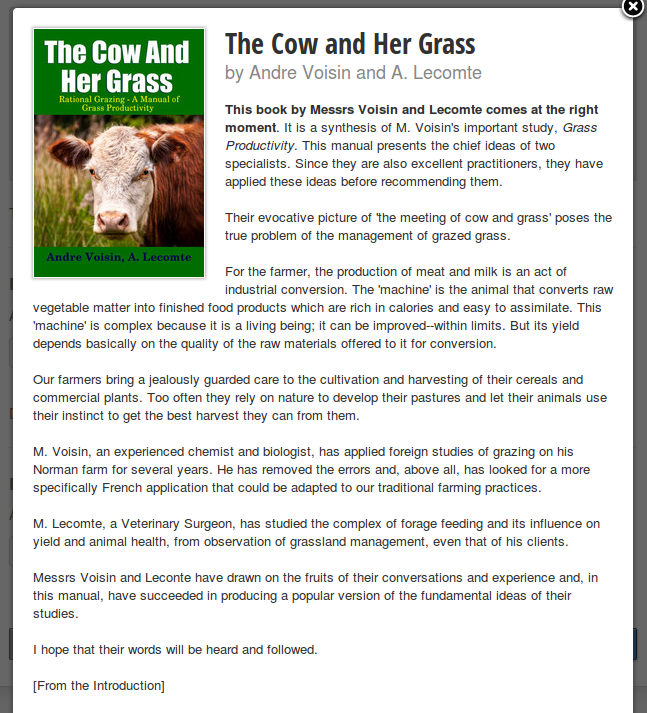 Note: there's a 2MB upload limit, so watch those PDF's and illustrated .epubs.